You are a U.S. citizen or a permanent resident with either a Social Security Number or EIN (employer ID number). You have a U.S. address, U.S. bank account and state-issued ID such as a driver’s license. You have a major U.S. credit or debit card. Click the box labeled Amazon Payments and follow the link. If you don’t have an Amazon Payments account, you’re instructed to set one up. 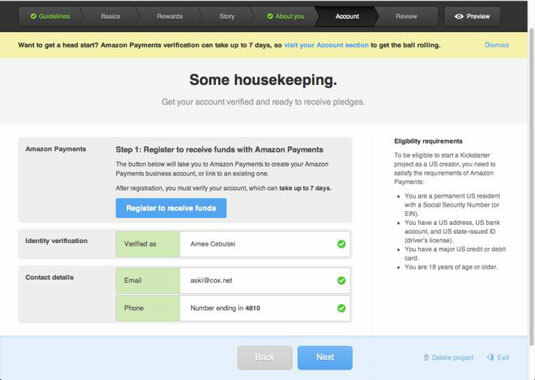 You can begin the setup for Amazon Payments directly from the Kickstarter website. Next you verify your identity. This allows Kickstarter to be sure that you are who you say you are. Click Identity Verification and begin entering the details requested regarding your address, Social Security Number, and driver’s license number. The final step in setting up your Account tab is entering your contact details. This is how Kickstarter will contact you with backer updates, questions, or follow-up needs. Enter your e-mail address and phone number in the boxes where indicated. Be sure that your spam filters are not set too high on whatever e-mail account you use for Kickstarter; otherwise they may reject verification e-mails as spam. You can also set your e-mail spam settings to allow any e-mails from the domain kickstarter.com. After you’ve input all the required information in the Account tab, it can take up to 48 hours for everything to be verified.